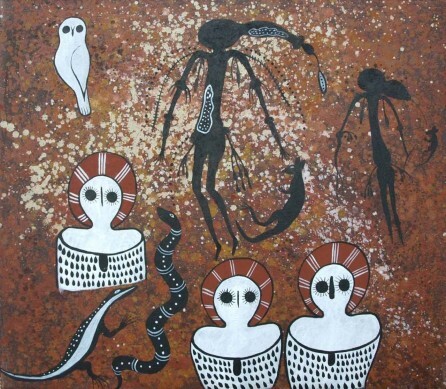 Snake artworks in Aboriginal Australia show the symbolic powers attributed to the snake, as an underground force and also as the Water spirit. Aboriginal artists incorporate animals from the natural world around them into their art and stories. 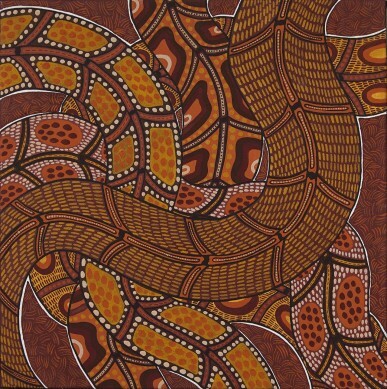 Snakes are indigenous to all parts of Australia and feature strongly in the Creation stories held by Aboriginal people and in their paintings and carvings. The snake has been used as a symbol of strength, creativity and continuity since ancient times across many societies. Using its powers to disappear into the earth and to re-appear in other locations has given the snake a symbolic power that is represented in stories and art. The snake is seen as a Creation Ancestor in Aboriginal Australia and its journeys across the country create aspects of the landscape. It is linked to the earth because it burrows underground, but it is also closely linked to water. As a representation of the Rainbow Serpent or Water Snake, this powerful spirit protects and lives inside the water locations. It travels between water sites and must be approached with respect when coming in to contact with these places. It has powers to conjure up devastating storms and destructive winds. Aboriginal people have great knowledge of the natural world around them and the snake is seen as a strong force in the animal kingdom and one to be respected. Although an Ancestral spirit and a clan totem in the Kimberley, the snake is also a food source and may be hunted for food. Warlpiri people paint the snake vine in the Ngalyipi Jukurrpa, where the fibre is used for weaving ritual artefacts and items that are used in ceremonies. The snake image may be seen in many forms in paintings, where it may be shown as its naturalistic shape, its tracks when moving or as its symbolic Spirit force.